A walk for awareness was organized by the family of a 19 year old diagnosed with oral cancer. What a story! She had some dental work over the summer last year and told not to eat until the numbness wears off. She was hungry and ate despite doctors orders figuring it’s no big deal to keep food on the other side. To her dismay, she bit her tongue. A sore developed that wouldn’t heal. Already back at school, she went to the campus health facility at the University of Arizona. They referred her to an oral Surgeon who told her to watch it and wait until Thanksgiving break. When it didn’t heal, the oral surgeon biopsied it. In early December, when she was back at school her dad called her with the news: Squamous Cell Carcinoma. She had surgery at the Mayo Clinic in Scottsdale before Christmas which included the removal of 1/4 of her tongue and a neck dissection since one lymph node had cancer. She was HPV negative. The tongue is NOT a common site for HPV. 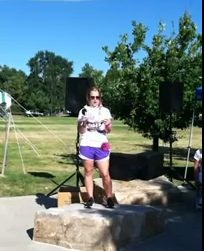 The following summer, she was asked to speak at a walk for oral cancer awareness. She spoke with sincerity and clarity. Younger people are being diagnosed with this terrible disease. It’s more critical than ever to be sure you are getting a thorough oral cancer screening at every dental check-up. Are you getting it? Visit SixStepScreening.org for details about an oral cancer screening. I wonder if she had something developing on her tongue for a while but she did not feel it since early stage oral cancer is often painless. Fortunately, she ate when she wasn’t supposed to, and bit her tongue, after which she was able to see and feel the cancerous sore. Luckily, when the sore did not heal she was referred to an oral surgeon who diagnosed the oral cancer. Take note of any changes in your own mouth and look at your tongue and oral tissue. If something looks a little different, take a digital picture and look again in another week. If it doesn’t seem to be healing, or it’s changing, be sure a dental professional follows the changes and catches pre-cancerous conditions.